It's So Cold In England Even The Racing Snails Are Curling Up : The Two-Way A pub in Devon disappointed guests by cancelling a snail race as an arctic cold front hits much of Europe. Forecasters are warning a Siberian Arctic blast nicknamed the "beast from the east" is enveloping the U.K. in the coming days. 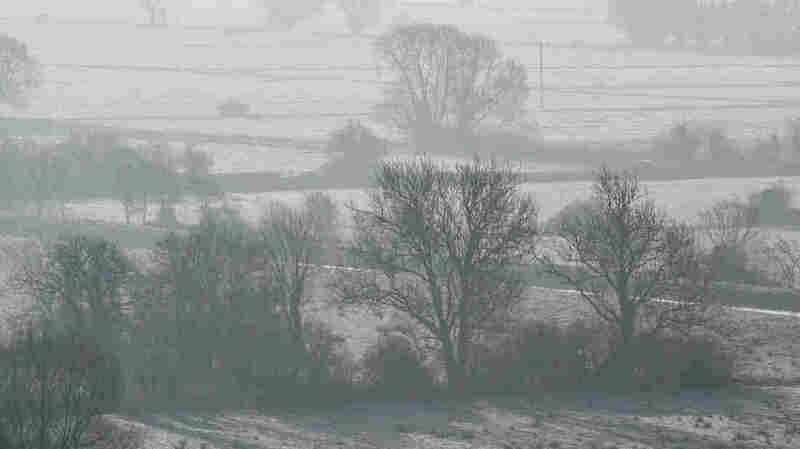 Here the winter sun is seen in Somerset, England on Friday. It's not called a snail's pace for nothing, but just how slow is too slow for the mollusk to move? According to a pub in England, hibernation is where they draw the line. The Dartmoor Union Inn in Devon was promoting a snail racing championship for Saturday, promising guests, "each thrilling race will last about 4 minutes with guests able to bet on their favourite snail." Proceeds would go toward city emergency services. Do Racing Snails Drive Racial Stereotypes In 'Turbo'? Except it's so cold in the United Kingdom that even the snails are hunkering down. The pub posted on Facebook Thursday, "Unfortunately due to our snails being extra sleepy we have had to cancel the snail racing championships this Saturday!" Luckily, snails come equipped to ride out a cold snap. They "make a dried lid of slime over the shell mouth, which seals in the snail for several months," reports the BBC. It comes as much of Europe is battling bitter cold air moving over the continent from Siberia, a front British media are breathlessly calling "the beast from the east." As The Guardian put it in one cheeky headline: "Flake news! Russia spawns 'beast from the east'." Liam Dutton, a U.K.-based meteorologist tweeted that the country "will have its coldest spell for at least five years," with daytime temperatures around 32 Fahrenheit, falling to 14 degrees overnight. England's department of Public Health says "a significant wind chill" is compounding the cold on top of "significant accumulations" of snow Monday and Tuesday. They are asking residents to be mindful of the elderly and young children. "Cold temperatures, indoors and out, pose real health risks to many and every winter we know that thousands of people get ill and even die following exposure to cold conditions," the agency said. The U.K.'s national weather service, The Met Office has issued severe weather warnings across much of the country. As for the gastropods at the gastropub, The Dartmoor Union Inn has no current plans for escargot; they say the snail race will be rescheduled.